There are cat people; there are dog people. Well, guess what? States divide along those same furry lines. The majority of Americans love their pets—56% of U.S. households have one. 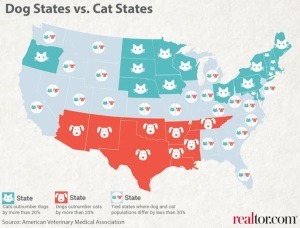 So enough already about all of this red state vs. blue state nonsense: Do you live in a dog state or a cat state? Which beloved domestic animal reigns supreme by state? To find out, we took a deep dive into pet population data from the American Veterinary Medical Association. Check out our map to find out if your pet preference falls on the right side of your state lines. (Note: Data for Alaska and Hawaii were not available. Sorry!) And for those who really want to know where Fluffy stands, check out the detailed cat and dog population data at the bottom of this article. OK, let the house-trained beast battle begin! Our findings revealed plenty of interesting cuddly animal-specific trends. Example: Roughly speaking, Southern states are more Fido-friendly than Northern states, which tend to be the cat’s meow. 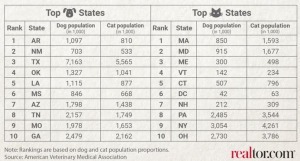 Massachusetts is the biggest feline state with nearly 2 times more cats than dogs. Arkansas ranks No. 1 in ratio of dogs to cats. Nationwide, though, cats outrank dogs 74 million to 70 million. Though dog owners are a larger number than cat owners—due to multiple cat ownership by household. Bottom line: It’s no surprise Americans lavished $30.4 billion on all those furry family members last year, up from $17.8 billion in 2000, according to The Wall Street Journal. Luxury buildings are offering upscale amenities such as rooftop dog runs and spa “pawdicures” in order to lure those free-spending pet lovers. “More people are shopping for homes and cars with the needs for their pets in mind,” said pet health and safety coach Arden Moore. But Realtor.com wanted to dig deeper. So the data team scratched its way into our 2.6 million active and recently sold home listings to tease out the most popular dog- and cat-friendly home features. There were fascinating revelations for Rover: Despite a prevalence of cat owners, we didn’t find a significant pattern of cat-friendly features in our home listings. That’s probably because the most common cat features such as cat trees, scratching posts, or self-cleaning litter boxes are portable rather than built in. And none of these features are things people want to brag about anyway. Read more over at Mental Floss about Washington Posts’ Wonkblog article on the state divisions which shows North Carolina as not being a divided state, but a Dog State —- Cats or Dogs, we love them both! Southport Real Estate, mangaves, Coastal Realty, Coastal Realty Connections. It may sound silly, but she sheds are popping up in backyards across the nation as women look outside the confines of their own home for a space that’s all theirs. It’s the (totally acceptable?) grown up version of claiming a space and then posting a ‘no boys allowed’ sign prominently on the door. Much like pub sheds, “she sheds” are the latest craze in the battle to add a touch of personality to any and every space. Whether you’re looking for a tranquil environment to practice yoga, a quiet space to work on your writing or just a place to get away from the stresses that come with your day-to-day routine, “she sheds” run the gamut from rustic to extravagant. Need a little inspiration? 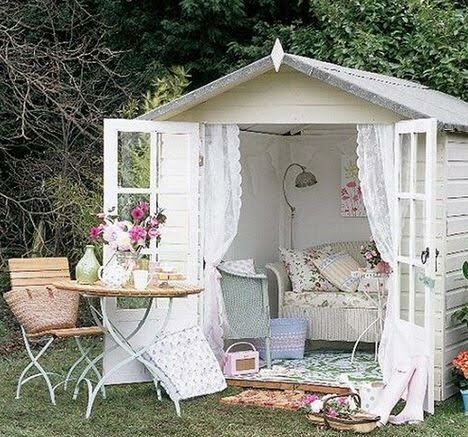 Check out the pictures that we found on the Lighter Side of Real Estate site and start planning what your “she shed” will look like today!